It is not always easy to recognize that a child might be visually impaired. Although even very young children can show some physical signs of having trouble with vision, many times problems with a child's eyesight are not detected until after he goes to school. 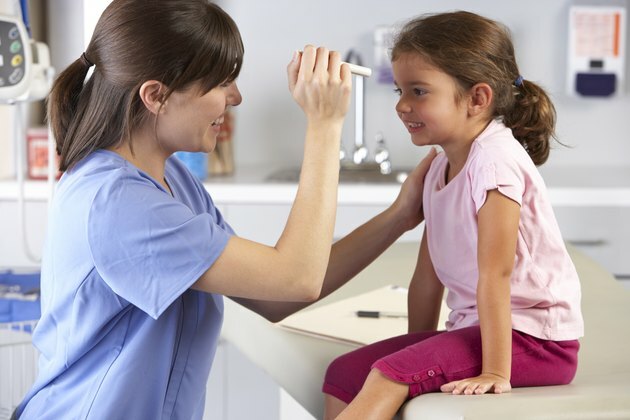 The American Optometric Association points out that because 80 percent of a child's learning relies on his vision acuity, early detection and treatment are needed. Crossed eyes, eyes that turn out, eyes that flutter from side to side or up and down, or eyes that do not seem to focus are physical signs that a child has vision problems. Other problems are less obvious. The American Academy of Pediatrics recommends that children have their eyes checked during regular well-baby visits throughout their first years. A child should have a routine eye exam every year beginning at age 5. A child might have a vision problem if he appears to be overly clumsy. Poor vision might be the cause when a child is constantly running into things or falling down. He might have trouble realizing how close or far away objects really are. The eyes provide the information about surroundings and spatial position that is transmitted to the brain. Consequently, clumsiness can occur when the eyes misjudge a distance. Sometimes young children who do not walk well actually have problems with their vision. Some children who have vision problems appear to have a short attention span. Other children might blink frequently or squint whenever they read or watch television. Often children are sensitive to bright light or might sit close to the television or hold books that they are reading close to their face. Likewise, younger children with visual impairments might hold toys very close to their face. Poor eye and hand coordination can be another sign that a child has a vision problem, therefore parents should observe a young child as he plays. Older children who go to school might have difficulty with sporting activities or certain projects in class. Signs of poor eye-hand coordination might include difficulty throwing or catching a ball, tying shoes or copying schoolwork from the blackboard. Poor handwriting is often another sign of poor eye-hand coordination. Children who suffer from lazy eyes, crossed or wandering eyes can have problems with coordination, balance and depth perception, primarily because they learn to use only one eye at a time. Children who have trouble seeing often perform poorly at school. Frequently, problems with learning are actually related to poor vision and not to a learning disability. A child might not read well, or might use her finger to follow along when she is reading so that she doesn't lose her place. Some children also have trouble remembering what they read. Children with vision problems can find it difficult to write as well or might have problems with math and other subjects. Schoolwork can be a challenge for a child who cannot keep a clear focus, deals with double vision or blurred print on pages. Unfortunately, not all vision problems are easily detectable. For children who have had vision problems from the start, their vision seems perfectly normal to them, so they don't usually complain. What Are the First Signs of Lazy Eye in Infants? How Long Does It Take a Newborn Infant to Be Able to See Clearly?